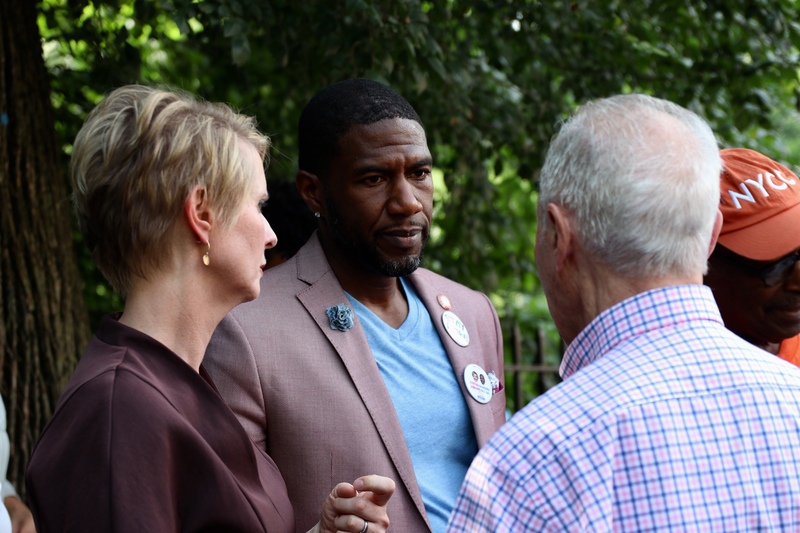 PROSPECT LEFFERTS GARDEN – Cynthia Nixon endorsed Council Member Jumaane Williams for Lieutenant Governor and Williams endorsed Nixon for the next Governor of New York yesterday. On a hot summer Sunday afternoon, supporters of Nixon and Williams gathered outside the Lincoln Road and Ocean Avenue entrance in Prospect Park. Supporters were getting ready to canvas around the neighborhood, but not before hearing Nixon and Williams speak. Both candidates were all smiles and laughter. “It’s time. Let’s go!” Williams led a chant before addressing the crowd. 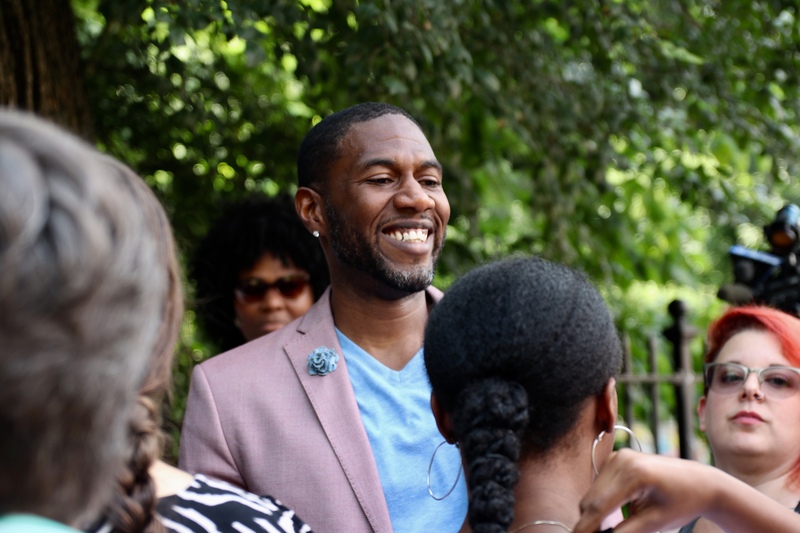 Williams, currently representing the 45th City Council district, announced his candidacy for Lieutenant Governor at the end of February. He is an activist, going on trial tomorrow for charges related to his arrest trying to stop the deportation of immigrant rights activist Ravi Ragbir. 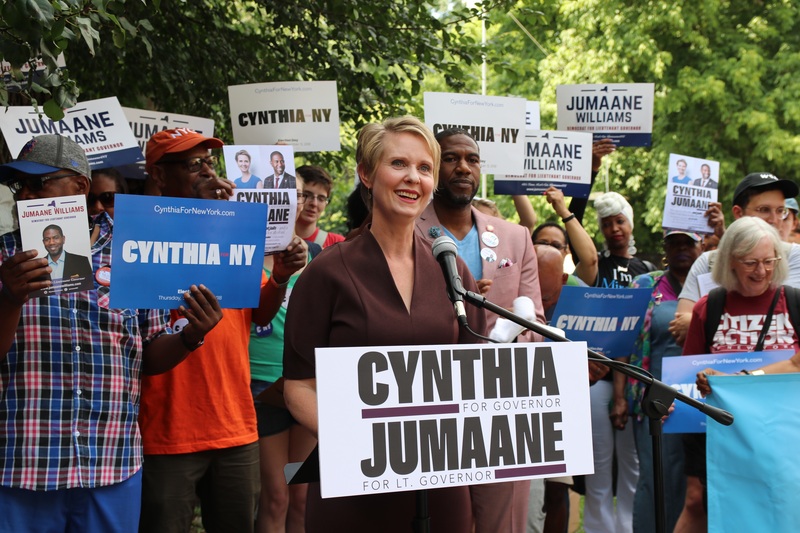 Nixon is a strong progressive candidate running against the incumbent Andrew Cuomo to be the next Governor of New York. 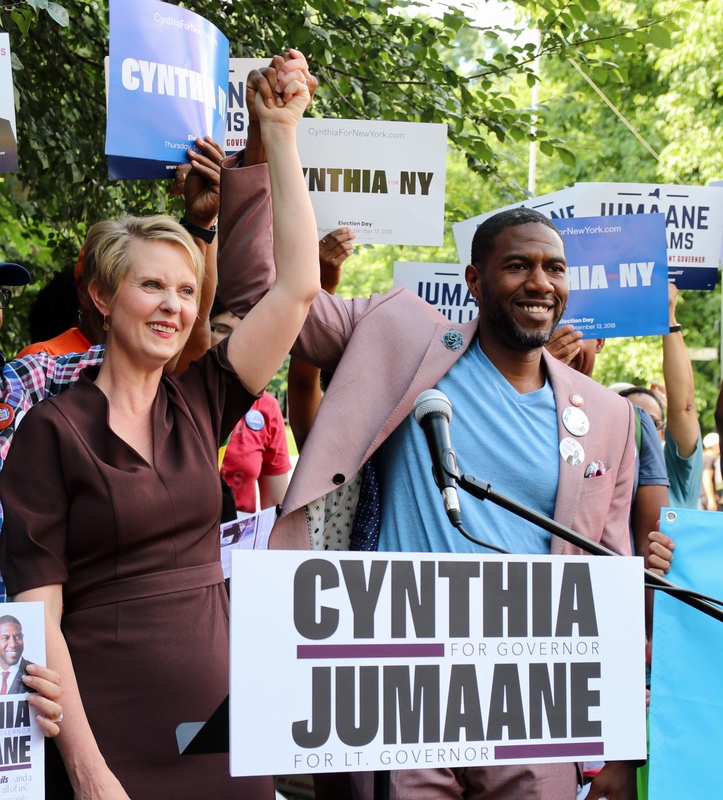 Though the candidates run on separate tickets in the primaries (mark your calendars for Thursday – not Tuesday – September 13) Williams and Nixon announced their full-fledged support for each other. 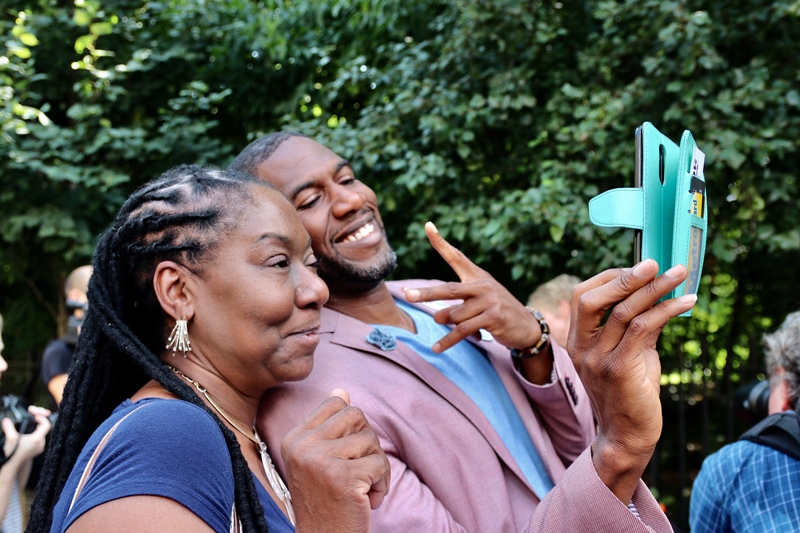 Funding schools and not jails is a stance both Williams and Nixon are very passionate about. It is the first thing on Nixon’s issues platform on her website. As Governor, Nixon plans to provide underfunded schools adequate funding, expand diversity among teachers, and make sure specialized high schools aren’t segregated. Children shouldn’t be criminalized and referred to the cops either, Nixon said. 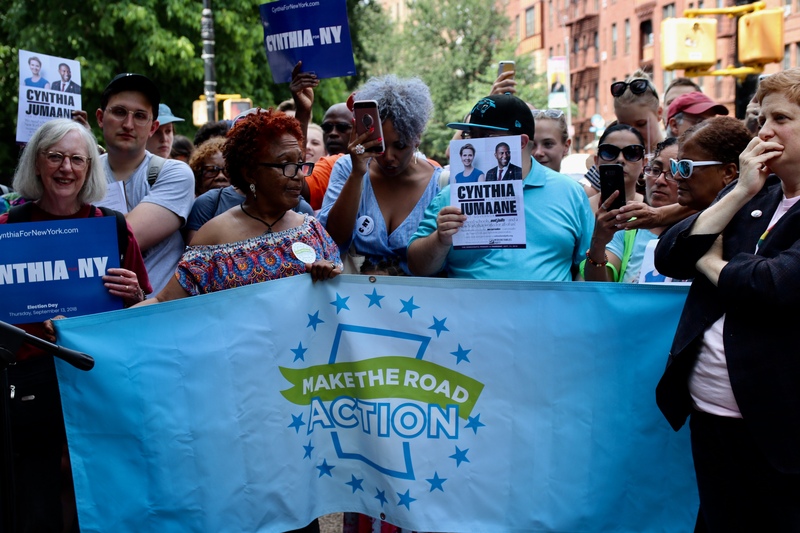 “[Cynthia] has been an activist in education for a very long time when it wasn’t a popular issue to be discussing,” Williams said, wholeheartedly supporting Nixon’s every platform. Both Nixon and Williams didn’t shy away from taking jabs at Cuomo or Lieutenant Governor Kathy Hochul. “If the Governor believed in everything he said, he would support me too. But he doesn’t, so he won’t,” Williams said. According to Williams, the word “leadership” shouldn’t be ascribed to Cuomo; he’s more of a follower, Williams says. In 2012, Hochul received the endorsement and an ‘A’ rating from the National Rifle Association (NRA). During her time as an Erie county clerk, she streamlined the gun permit applications. She also opposed former Governor Elliot Spitzer when he proposed drivers licenses for undocumented immigrants in NY. 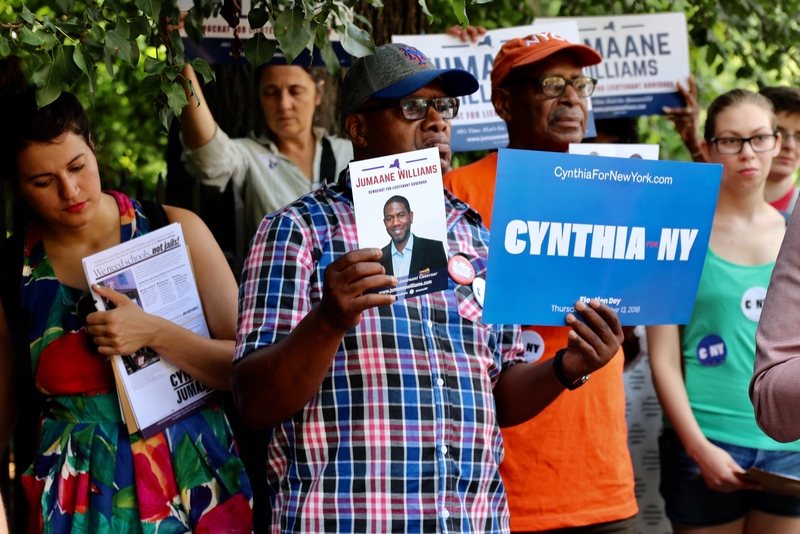 “We don’t need a Lieutenant Governor who said they would turn people over for applying for a drivers license if they didn’t have documentation; the same driver’s license that got Pablo the Pizzaman and two grandparents detained because they didn’t have the proper ID,” Williams said. The first day that she is Governor, Nixon promises that she will expand access to drivers licenses for all undocumented immigrants. Criminal justice reform is also a huge platform for both Nixon and Williams. Nixon told the story of Kalief Browder, a 16-year-old black man from the Bronx. Browder spent three years in Rikers Island awaiting trial without ever being committed for a crime. He had been accused of stealing a backpack. During Rikers, he faced physical abuse and was placed in solitary confinement. When he was finally released, he took his own life. The Left had better wake up. If we keep putting forward joke candidates like these, we’re going to keep getting stuck with idiots like Trump in office. Apparently we are not supposed to comment on this article. In that case, can’t you simply turn comments off? I don’t want to waste my time commenting on an article when comments are not allowed. I don’t want to waste your time, either, by having you read a comment that you cannot publish. It’d be much better for everyone if you simply turned comments off. –Thanks.